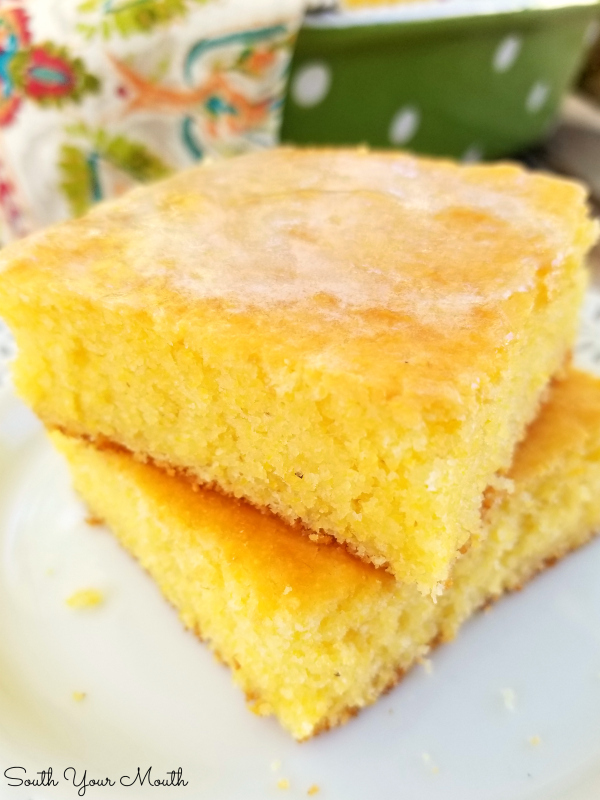 A spiffed up, semi-homemade recipe using Jiffy Cornbread mix, sour cream and real melted butter for a super moist and tender, absolutely perfect pan of cornbread. I grew up eating Jiffy cornbread, which we referred to a ‘sweet cornbread’. We also made a more rustic, homemade cornbread that wasn’t sweetened, which we just simply called ‘cornbread’. Jiffy is made with flour and cornmeal so it has a more cake-like consistency whereas our homemade cornbread is made with all cornmeal so it has a coarser, more rustic texture. We tended to eat Jiffy when we had vegetable beef soup or when we needed a quick bread to go along with a simple supper. I love to crumble up a hunk of Jiffy cornbread in a bowl of vegetable beef soup until it’s soaked up almost all the liquid then gobble it up. We ate the other, unsweetened, more rustic version with bigger meals like Sunday dinner and especially, for some reason, when we were eating pork. Anyway, I love both types of cornbread. There are some who will not eat one or the other and swear allegiance to only one version of cornbread. 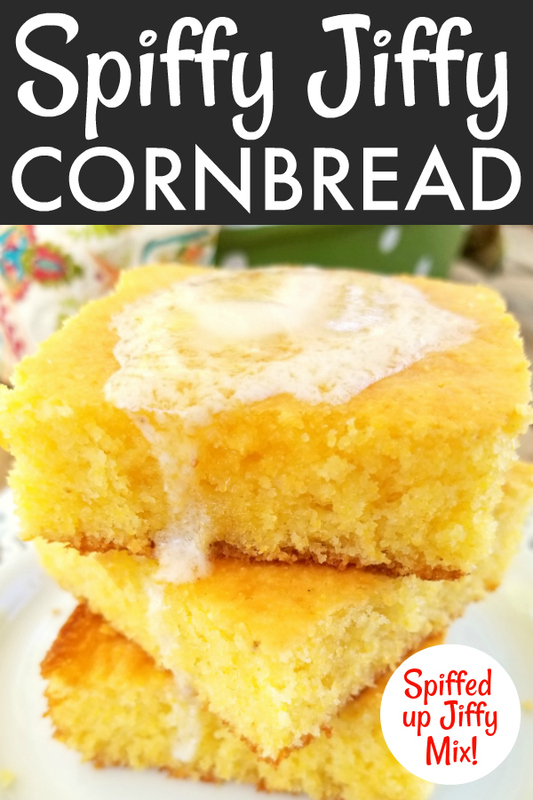 I never met a cornbread I didn’t like, so I’m good with either! As long as I know which one I’m eating before I taste it. 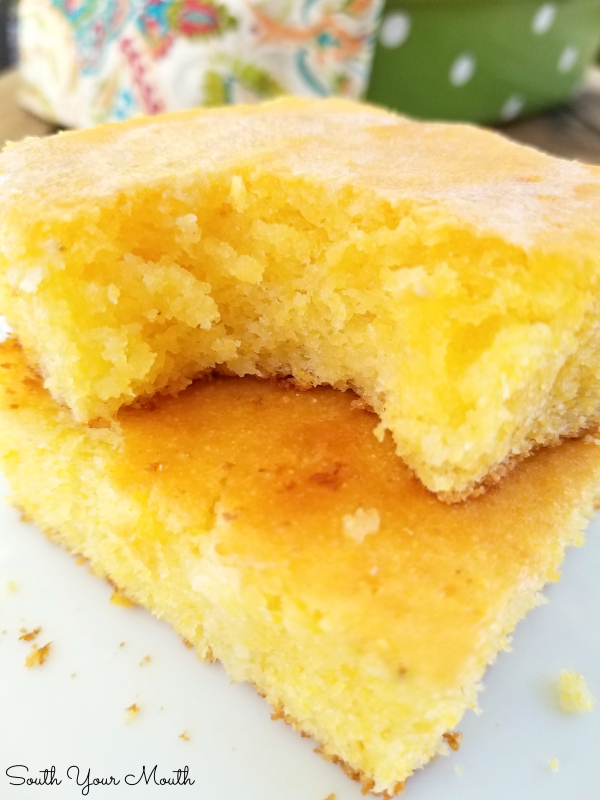 There’s nothing worse than expecting an unsweetened cornbread then taking a bite of something that’s a close cousin to cake. It’s like taking a bite of a sandwich and realizing someone made it with Miracle Whip. GOTTDOG! That’ll get your attention! Anyway, my very verrrrrry favorite way to make Jiffy cornbread is this special way! I call it Spiffy Jiffy because you take something very simple and basic then spiff it up into something very special and decadent. Every time I make this and take the first bite I am still blown away with how absolutely perfect it is! It's like eating something amazing for the first time, every time. The sour cream knocks down the sweetness a bit, which I like. I think it makes a more middle-of-the-road cornbread that everyone can enjoy no matter which type of cornbread you prefer. If you’re a sweet cornbread lover, simply add a few tablespoons of sugar to the batter if you'd like. It's still a bit sweet without adding extra sugar but for those of you who like yours somewhat cake-like, you'll want to add a little. The melted butter and sour cream make this cornbread the moistest ,most decadent cornbread you’ll ever eat. Seriously, this stuff is almost orgasmic. And I’m not even kidding. You will need a moment to compose yourself after you take your first bite. Especially if it’s still hot and is drenched with melted butter! Preheat oven to 400 degrees and grease a 13x9 baking pan. 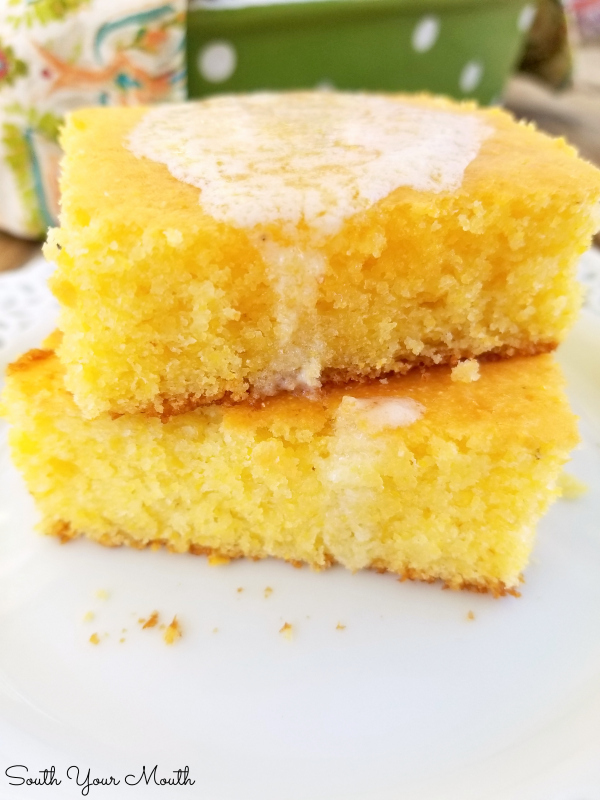 Tip: For light and fluffy cornbread, it is important to always cook it immediately after mixing the batter - don't let it sit while greasing the pan or waiting for the oven to come to temperature. Combine sour cream and eggs in a mixing bowl then whisk together until eggs are beaten. Whisk in melted butter and milk. Add dry corn muffin mix to wet ingredients then whisk together until just combined and most of the lumps are blended in. Pour the batter into prepared pan. Smooth and level batter then bake at 400 degrees for 25-35 minutes or until golden brown. Serve hot and enjoy! Jiffy cornbread is known for being a sweet cornbread. 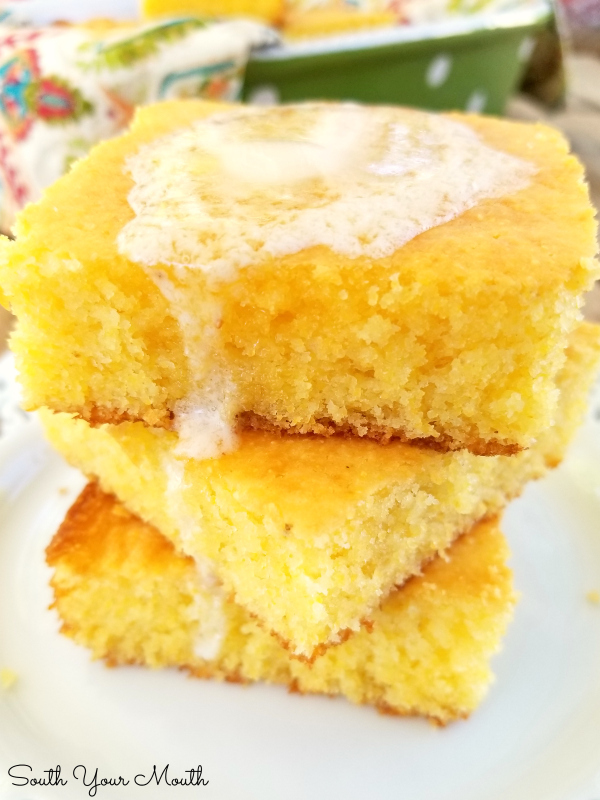 Adding the sour cream knocks down the sweetness a bit in the very best way but if you enjoy sweet cornbread consider adding a few tablespoons of sugar to the batter. I like to grease my cornbread pan with hot bacon grease. Just add a couple tablespoons of bacon grease to your pan then place it in the oven until the grease is sizzling (but not smoking). Remove pan then swirl the grease around to coat the inside of the pan. If you can’t find Jiffy Corn Muffin Mix and need to use another brand, use as many packages as needed for 12 servings. 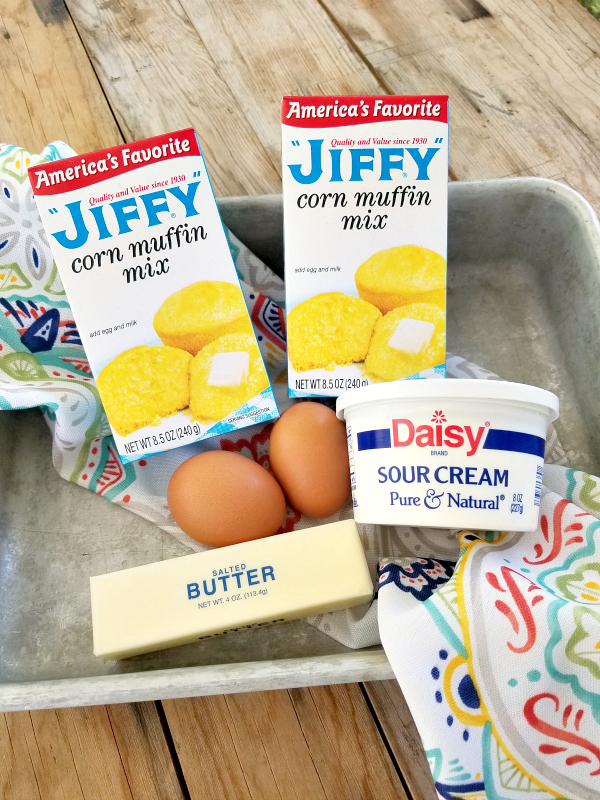 A box of Jiffy Corn Muffin Mix makes 6 servings which is why we use 2 boxes in this recipe. 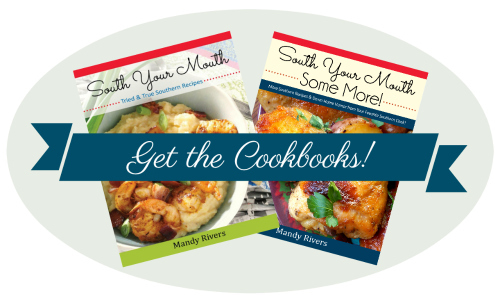 Consider topping the cornbread with melted butter before serving. I make something very similar to this but only use 1 box of corn bread mix, no milk and I add a can of drained corn and a can of creamed corn. I bake it a little longer because with all that corn 30 minutes makes it more like spoonbread. I cook it almost an hour. I love the leftovers (when there are any) warmed a little and drizzled with honey for breakfast. Yum! I think I'll make some for Easter! Unknown at 2:27PM, you could be me! I make it as Mandy lays out here, but I also sometimes add an 8 oz can of creamed corn or a handful of frozen corn when I'm feeling frisky. And I agree on the butter and honey on lightly toasted leftovers. Perfect with eggs for breakfast. MMM! LOL I haven't heard that in years! So which are you? Would you share your recipe for the all cornmeal cornbread? Pretty please.